GameArt has been pushing their brand on the international market with recent deals signed with Nyx, EvenBet, PlanetWin365 and many other operators. They have started 2018 with an excellent display of design in the King of Monkeys pokie. GameArt have a relatively small library of games but their distinct design makes their games shine through. 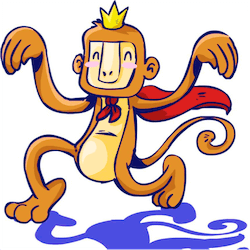 King of Monkeys melds cartoonish characters and colours with an almost realistic CG look. Everything from your heads up display to the animations that play when you strike it big look great. Even though GameArt is a relatively small developer, they always manage to deliver premium looking pokies. The red and gold Chinese symbol is a wild icon here which also triggers the main jackpot. 5 Wilds on a payline will award players with an incredible 100x their total staked wager. There is also the green temple entrance symbol that activates the free spins bonus game. During the free spins game, if three of the student picture symbols appear on consecutive reels, then the Monkey King symbol will start appearing on the reels. This is the highest valued in-game symbol. This will also trigger the Special Dragon Feature. This sees a giant dragon fly across the reels and turn the student picture symbols into a single matching set of symbols, which can include the high value King Monkey symbol. To add some more opportunities for big wins, GameArt have also added a Gamble feature where you can double any payouts you receive. You can Gamble up to 5 times in a row. This feature needs to be activated in the options menu, it will automatically deactivate if you are playing in Autoplay mode. The Monkey King is a famous character from Chinese literature and he has been the focus of many movies, games, books and pokies, including Monkey King from Yggdrasil, Journey to the West from Pragmatic Play and Epic Journey from Red Tiger. King of Monkeys can hold its own against the competition thanks to the many features GameArt has added in. The main jackpot isn’t that impressive, with 15 000 being available to win, but that is simply down to the low maximum wager players can make here, which is limited to 15 per spin. That said, GameArt’s use of 243 betways on their reels give players a much more player friendly 96.2% RTP which should convince more pokie fans to try this game out.